We have the pleasure of working with horses and clients from all over the world. Our goal is to work with you in order to find the dressage horse of your dreams that also fits into your budget. Our dressage horses are chosen because of quality, temperament, and rideability. We take great pride in seeing our clients succeed for many years. We also take dressage horses on consignment for sale. Please don't hesitate to contact us if you don't see what you're looking for listed below. We always have horses who haven't been advertised. *** 2010 16hh KWPN (Ampere-Farmer) mare. This beautiful mare is schooling the PSG and definitely has the talent for the Grand Prix. She's very rideable, light in the contact and extremely comfortable to sit. We also love that she's very well behaved in new places and isn't spooky. She's very sweet in the barn and loves hacking out on the buckle. *** 2009 16.2hh KWPN (FLemmingh-Pion) gelding. This is a top Grand Prix prospect with incredible talent for piaffe, passage and pirouettes. He has wonderful forward energy but completely safe for ANY rider. He's show up to PSG with a 69% and is ready to move up. Nothing fazed him and he's perfectly behaved in new place. 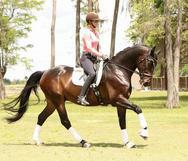 **** This 2011 17hh Hanoverian (Falsterbo-Wonderland) gelding. Flyby FLF was the Markel 6yr old Reserve Champion. He's been successfully brought up through the young horse program. He's the unique combination of enormous talent and top rideablity. He's currently ready to show PSG and is schooling the Grand Prix. **** 2012 16.2h KWPN (Florestan-Godfather) mare. This super mare has very elastic uphill movement and excels at collection. She's currently schooling 4th level with piaffe and passage. We feel she has all the characteristics to make a competitive Grand Prix horse. While she is a quick learner she is also very kind and suitable for any rider. She also loves hacking and is very brave. She's not marish and loves to be brushed. ** Talented 2012 16.2hh Hanoverian (Romancero H-Hawk Hill) mare. This beautiful mare is confidently schooling 3rd level with clear talent for the Grand Prix. She has excellent lateral work and shows great talent for piaffe and passage. She's light in the bridle and naturally uphill. She also loves hacking. In the stable she's very affectionate and loves attention. Horses that Dressage Stable VDB has sold to their wonderful new homes. ** 2012 16.3hh Hanoverian (Belstaff-Freiherr) gelding. Extremely safe and uncomplicated gelding ready to show 3rd level. He is easy in the connection, nicely forward and very simple to ride. He's the perfect type to help a rider gain confidence in their ability or he's talented to develop to FEI. He's great out hacking or riding in the field. He's the perfect horse that you can depend on in any environment.